Saw 3D Premier Invitation (Direct Mail): In order to solve the puzzle, people used a sterile lancet to prick their finger to get a drop of blood. Once they draw some *blood and then wiped it on the embossed surface, a secret code reveled on the page. These codes were free tickets to the premiere. *one tiny tiny drop is enough, see how it works below. 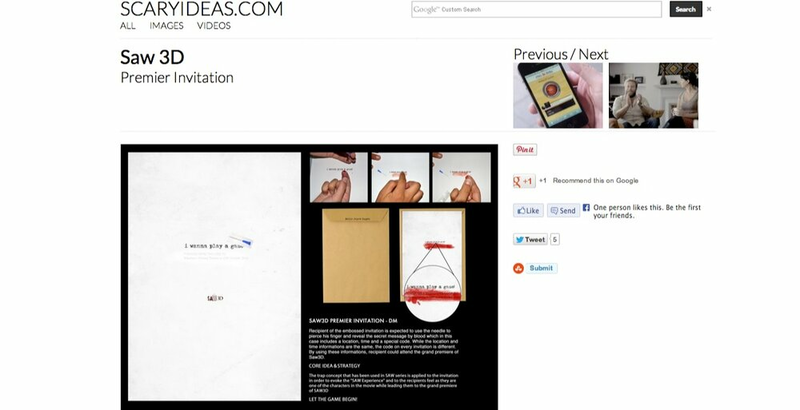 We created a jigsaw-direct mail that turned into a viral hit overnight amongst SAW fans. It also got featured by ad blogs around the globe.